This Chicago Cubs ended the 108 year wait by winning the 2016 World Series. Big Time Bats has released a limited number of White W bats signed by World Series MVP Ben Zobrist. The bats feature the iconic Blue W, the words "2016 World Series Champions," and all of the highlights of the 2016 season, including final Regular Season record, All-Stars, batting leaders, pitching leaders, and MVP award winners. Ben Zobrist signed each bat, which is fully authenticated by MLB Authentics. Zobrist was a free agent signing by the Cubs, adding much needed stability to the defense, reliable hitting and veteran leadership. Zobrist played both corner outfield positions, as well as 2nd base during the season. He drove in the game winning run during Game 7 of the World Series with a timely 10th inning double. 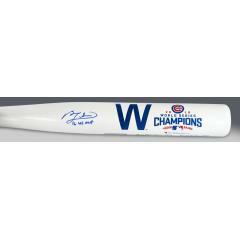 Ben Zobrist Signed Cubs 2016 World Series Champs "W" Bat $595.00 Sold Out!